San Francisco, CA & Dublin, Ireland; Wednesday 7th January 2015: In December Yahoo achieved its highest US search share for over five years according to the latest data from StatCounter, the independent website analytics provider. Google fell to the lowest monthly share yet recorded by the company*. 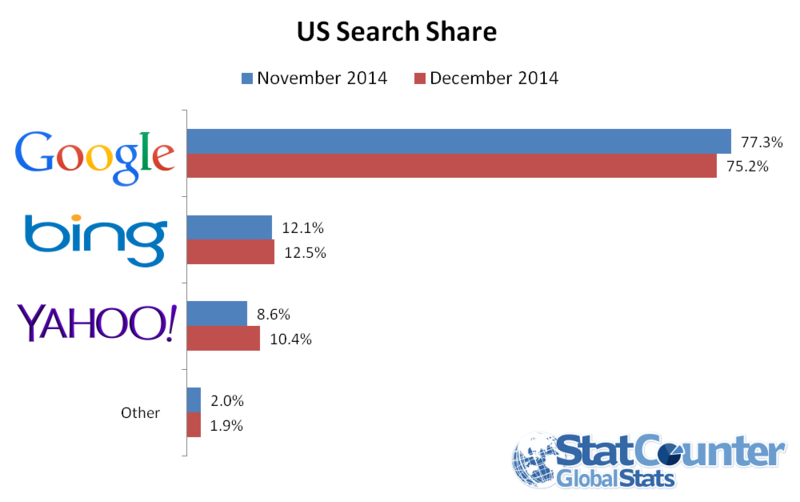 These December stats coincide with Mozilla making Yahoo the default search engine for Firefox 34 users in the US. StatCounter Global Stats reports that in December Google took 75.2% of US search referrals followed by Bing on 12.5% and Yahoo on 10.4%. As previously announced by Yahoo, December marked the start of its partnership with Mozilla. Yahoo is now the default search experience for Firefox 34 in the US, bringing an end to Mozilla's 10-year relationship with Google. "The move by Mozilla has had a definite impact on US search," commented Aodhan Cullen, CEO, StatCounter. "The question now is whether Firefox users switch back to Google." Firefox users represented just over 12% of US internet usage in December according to StatCounter. Last July, StatCounter announced a new feature in response to Google's removal of keyword data. By integrating Google Webmaster Tools (GWT) data into its reports, StatCounter has given its members the ability to access all available keyword intelligence which they can slice and dice all within their StatCounter account.